This week marks the hundredth day since Wikileaks released the first batch of the Embassy Cables – the most significant revelation in geopolitical history. Working first with Der Spiegel, El Pais, Le Monde, The New York Times and The Guardian WikiLeaks has since been expanding this cooperation to work with what is now a group of over fifty media partners from around the world, including: The Sydney Morning Herald (Australia), Swedish Television, The Sunday Star Times (New Zealand), NOS (Netherlands), Folha de São Paulo and O Estado de Sao Paulo (Brazil), Nova Gazetta and Russian Reporter (Russia), RUV (Iceland),), Al Akhbar (Lebanon), Al-Masry Al Youm (Egypt), El Comercio (Peru), L’Espresso (Italy), Daily Nation and The Star (Kenya & Uganda), CIPER (Chile) and many others (for the full list please see http://wikileaks.ch/Media-Currently-Publishing.html). At this stage WikiLeaks has published just over 5,000 of 251,587 cables, sent from US embassies around the world back to Washington. But the work has only just begun. To date, just over 2% of the cables have been published, all redacted by media partners to minimise possible, though unlikely, harm to innocent individuals named within. Wikileaks intends to continue this process until all cables have entered into the public domain where they can inform all of us. That is why phase two of the Embassy Cables project formally begins today. 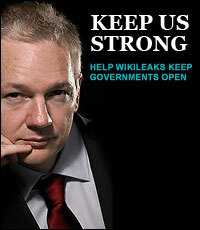 In the start of November, Wikileaks had five partners., we now have over 50 from every corner of the globe. Influential publications, activist groups and charities are being giving access to hundreds – or in some cases thousands – of cables relevant to their regions or causes. Secretary of State Hilary Clinton, spokesman, officials and senators lined up to condemn Wikileaks’ efforts to let the world know the reality of US foreign policy, often ignoring Wikileaks’ protections of sources, and ‘forgetting’ Wikileaks is a journalistic organisation protected by the First Amendment. For its part, the State Department refused outright to detail any concerns they might have with the material. Words weren’t enough for the US government: multinational corporations, including Bank of America, Visa, Mastercard, Paypal, Amazon, Swiss Post Finance, Money Bookers, and others have cut off Wikileaks after pressure by the State Department and hawkish senators—all entirely outside any judicial or even administrative process. Publicly declared task forces into WikiLeaks have been created at a range of US agencies, including the CIA, FBI, State Department, and even a 120 man unit at the Pentagon. Young volunteers who have merely supported our efforts or related causes are routinely detained and have their phones and computers seized at US borders. One alleged source, Bradley Manning, has now been kept in severe solitary confinement conditions for more than 280 days. US military law permits a maximum pre-trial detention of 120 days. These attempts have not, and will not stop our continuing revelations to the public. In the wake of the attacks on us first hundreds, then thousands, of courageous individuals and companies from around the world chose to join us in our struggle against censorship. Every cable that Wikileaks publishes is now automatically reproduced on more than 1,800 websites. The truths contained within these cables cannot be suppressed. The reason for our phased release is not to minimise trouble: it is to maximise impact. Even just a handful of these cables cover Venezuelan oil contracts, illicit African arms sales, corruption on the Gaza border, corporate sanction-busting, Sri Lankan war crimes, red mercury hoaxers and corporate sanction-busting. The cables contain material of significance on nearly every serious topic in every country in the world. We know from experience that to release everything on one day would lead the first few stories spotted drowning out all the others. Working with specialist journalists, and harnessing their local knowledge and contacts, makes sure that the stories that matter to each country around the world are found. Doing this takes time and resources. But by releasing day-by-day and week-by-week, the impact of this disclosure will be felt for weeks, months and years to come.